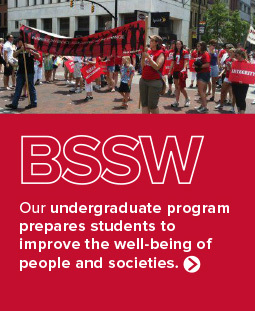 When you become a student in the College of Social Work, you join a community of people committed to making a difference in local and international communities. There are over 11,500 alumni from the College of Social Work who are using their expertise to make the world a better place. 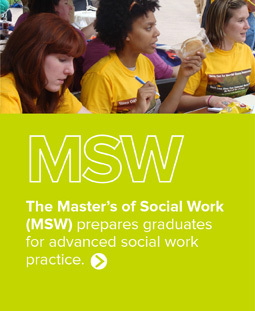 Our three degree programs help students acquire the knowledge, skills, and values that define professional social work. Our flexible and student-friendly curriculum allows students to prepare for careers in a variety of social service settings. We also offer elective opportunities for students interested in topics such as international social work, school social work, child welfare practice, or substance abuse. 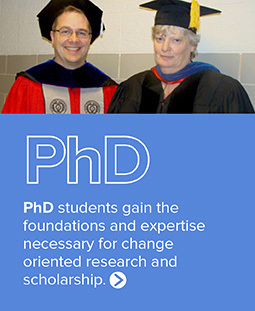 CHOOSE THE ACADEMIC PATH THAT FITS YOUR PERSONAL CAREER GOALS.